If you are bait fishing from the bank or boat you are going to want to have a rod holder. Holding the rod in your hand means you are ready to set the hook at a moments notice but it also means that every movement you make is transmitted down the line. There are a multitude of different types of rod holders available depending on what you are looking for. Here are some variations to think about. Find a fork stick and go to town. I still use this on occasion. free, simple, reliable its classic. Just make sure to set your drag down low so that your rod does go flying into the water is a monster grabs your line. A simple cheap and portable rod holder. You can buy these telescoping forked sticks for about $5 from most bait shops and fishing stores. They are basically the same a your standard freebie forked stick except that they adjust in length to match your needs and they compact down small so you can keep a set in you tackle bag or car trunk just in case. 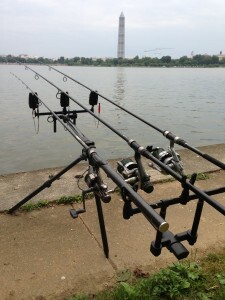 When I am roving up and down the shore with a single rod looking for new spots I love these. I have one in my back pocket and whip it out in seconds as I bounce from spot to spot along the shore. These sticks can be used in a pair or just one per rod. They down sides are that these are pretty cheap and the telescoping locks tend to break fairly easily making the rod collapse unexpectedly when pushing it into the bank. Another downside is that they don’t work in places where you can’t push the point into the ground and they can only be used to fish your rod at 45 degrees or less. PVC sand spikes can be the right choice in soft mud and sand. There are several models of rod holders that basically steel spikes with rod holders permanently attached to the top that you can drive into the bank. These are generally tough, cheap, durable and if put in the bank properly you can leave your rod’s drag tight because no fishing is going to pull your rod out. Bank spikes come in a variety of fishing angles from vertical to 45 degrees. The down side to bank spikes is that they are big and heavy. Some of the poorly designed bank spikes scratch up your gear or won’t fit certain rod handle styles/sizes. A diagonally cut piece of PVC pipe is used all the time in surf fishing as a vertical rod holder in soft and hard sand. These are good for keeping your reels out of the sand and allowing people to walk in front of your rods be elevating the tips above their heads. The also hold your rod tight so you can leave most drags activated without your rod flying into the water. 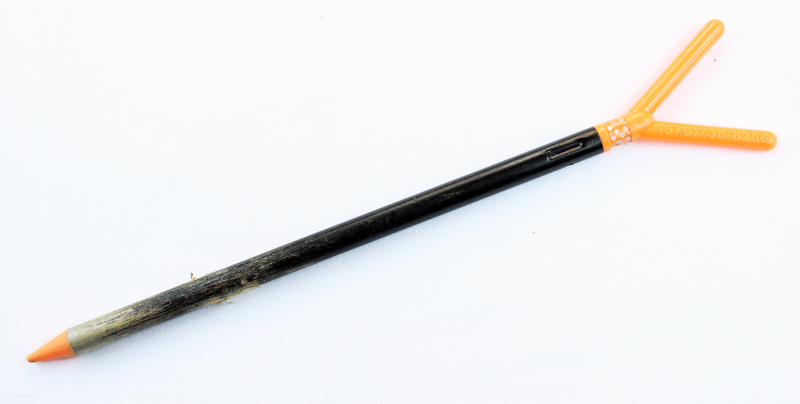 Bank sticks are telescoping steel and aluminum rods with 3/8″ BSF threads on top. They come in a variety of lengths and a you can screw in all sorts of accessories into the top. The advantage of bank sticks over plastic forked sticks is that they can be driven or screwed into ground to hard for wooden or plastic rod holders. Bank sticks are superior in their versatility as well. You can screw in an electronic bite alarm, a variety or rod holders or a goal post set up that will allow you to set up multiple rods. 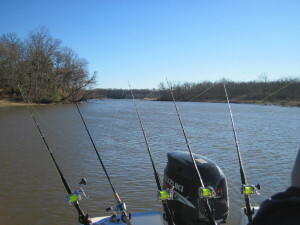 There is a perfect rod holder attachment that will fit your rod without scratching no matter what type of rod you use. 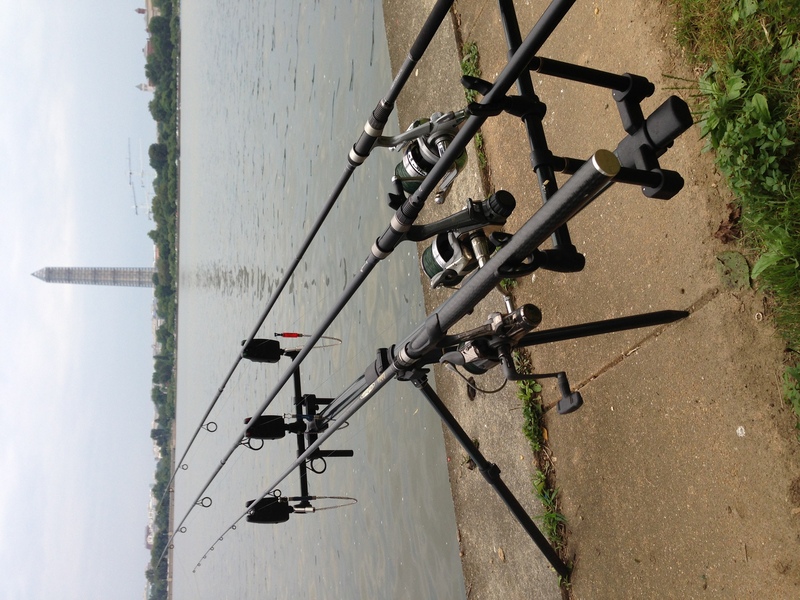 The rod holder accessories that go with bank sticks can also grip the rod tighter than a wooden or plastic rod holders and they can do so without pinching your line in the holder. These telescoping bank sticks are generally lighter and more compact than bank spikes or sand spikes plus you can carry a wide variety of rod holder attachments and accessories in your bag with very little room or weight. There are also attachments that allow a fisherman to mount a bank stick permanently or temporarily into wood. If you can’t drive your bank stick into the ground this is very helpful. A 3-rod rod holder with bite alarms allows you to use your rod holder on any surface. Rod pods are basically three of four legged rod holders that can stand on their old without needing to be driven into the ground. This means that you can use them on docks, concrete, rocks ect. 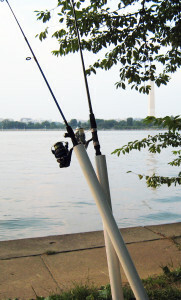 Typically rod pods hold three or four rods at a time. The advantage of a rod pod is that you can moved it around and place it anywhere. 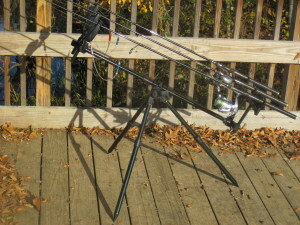 Some rod pods also allow you great versatility in the angle you choose to fish. These allow you to fish with electronic bite alarms in virtually any location. Sometime you can even set up you rod pod in the shallow water just off shore if the shore is too cluttered. The rod pod will keep your gear dry and out of the water. Most rod pods are made from lightweight alloys because they don’t need to withstand the force of being driven into the ground. The down side to rod pods is that they are expensive, the take up a bit of space in your bags. Some rod pods are also a bit more tipsy. I have had strong winds or a violent bite knock over my rod pod and thus all of my gear too. I recommend using a bungee cord to anchor your rod pod to the ground or a full bait bucket. Make sure your drag is set low whenever you rod is sitting in the pod. A nice spread of catfish rods and holders on the back of a catfish boat. 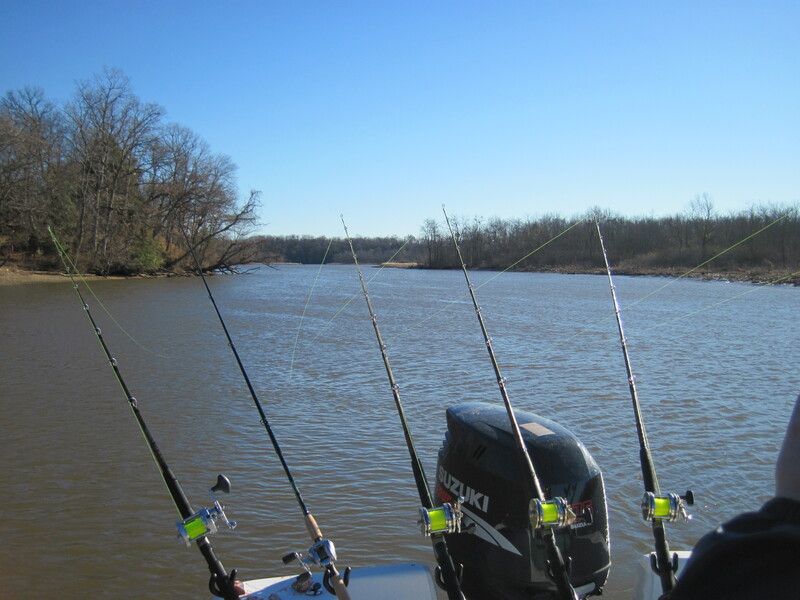 There are tons of varieties of rod holders for boats, canoes or kayaks. These generally lock your rod in place so you don’t have to lessen you drag when placed in the holder. A good rod holder is very rigid. One of the advantages of fishing with you drag set high is that you can let the fish set the hook on themselves. When the fish hits you want that line to go tight all at once not gradually. Braided line and good reel, a short rod and a rock solid rod holder will help. Having a rod holder that you can adjust the angle and direction is also useful. 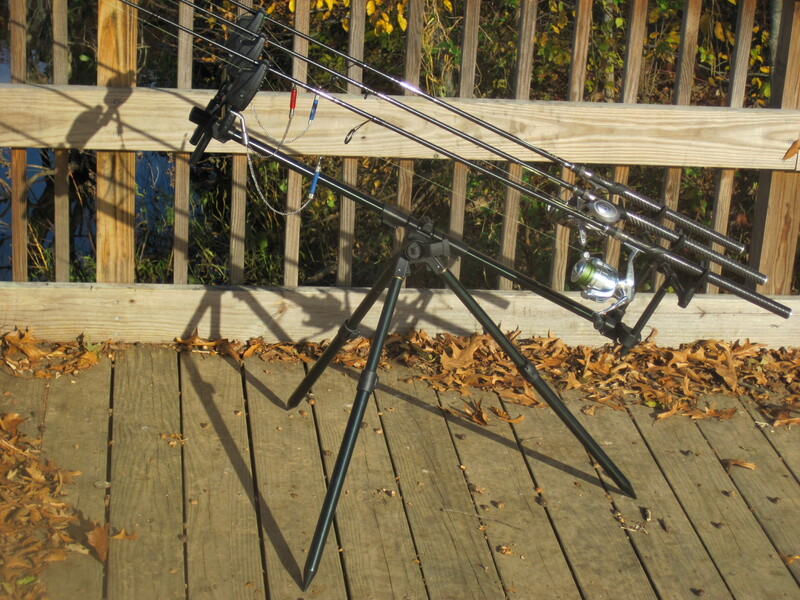 Moveable rod holders are convenient but tend to not be as sturdy and solid. Also make sure your rod holders with fit all of your rods and won’t scratch them up.